Last Fall, I attended a session on how to be a coach for the Dale Carnegie course on Interpersonal Communication & Human Relations. At the end of the two-hour session, the instructor, Vicki, gave each of us a handful of flower bulbs. "The idea," she said, "is that eventually all of these will blossom, but it may take awhile." For several weeks, the bulbs sat on a shelf in my garage. Each day, when I saw the bulbs, I thought about the class and also that I should plant the flowers! If you don't share knowledge with others no one will learn anything. After a few more weeks, I planted the bulbs in the planter above. 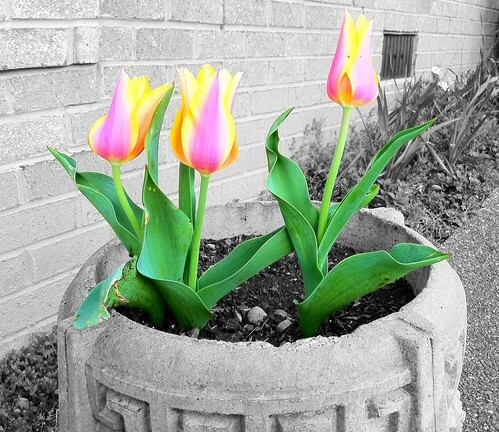 As Spring started, green shoots appeared in the planter, followed by larger leaves and the beautiful flowers. I didn't know what kind of flowers would be produced by the bulbs. At each point along the way, from the time I accepted Vicki's flower bulbs until these tulips bloomed, I thought about what these flowers represented - the belief that others have the potential to grow and blossom into something!